A sweet breakfast or brunch treat made with roasted sweet potatoes, this braided bread is an impressive addition to your holiday table. Welcome to day 6 of #EasterWeek hosted by Bernadette from Rants From My Crazy Kitchen! 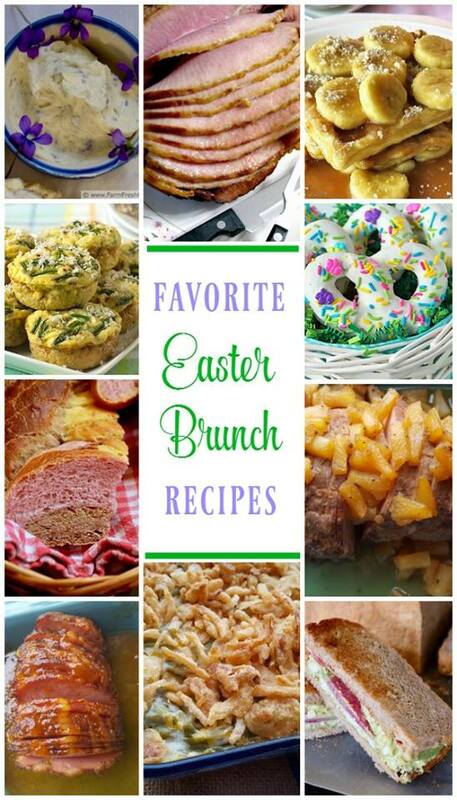 This week we are celebrating Easter and Bernadette’s blogging anniversary with all kinds of delicious recipes and a giveaway! From appetizers to ham recipes, we have everything you need for a great Easter dinner or brunch, and one lucky winner will receive a $200 Amazon gift card. Scroll down for more details! It's good to have a skill in your kitchen repertoire that can be manifested in a variety of ways throughout the year. This recipe is an excellent example of that. The technique of braided 3 strands of bread dough is a simple one to master, and once you've got it down you can turn out an infinite array of breads for nearly any occasion. [As I type this, my brain is thinking towards savory routes.] I learned how to braid bread while living in Finland where I made a cardamom-spiced version called Pulla [poo-lah] (you can find my Finnish Pulla recipe here). Sometimes I get creative before I start braiding the dough. I've flattened and spread ropes of dough with caramel pumpkin butter before braiding to make a Caramel Pumpkin Butter Stuffed Braided Bread. 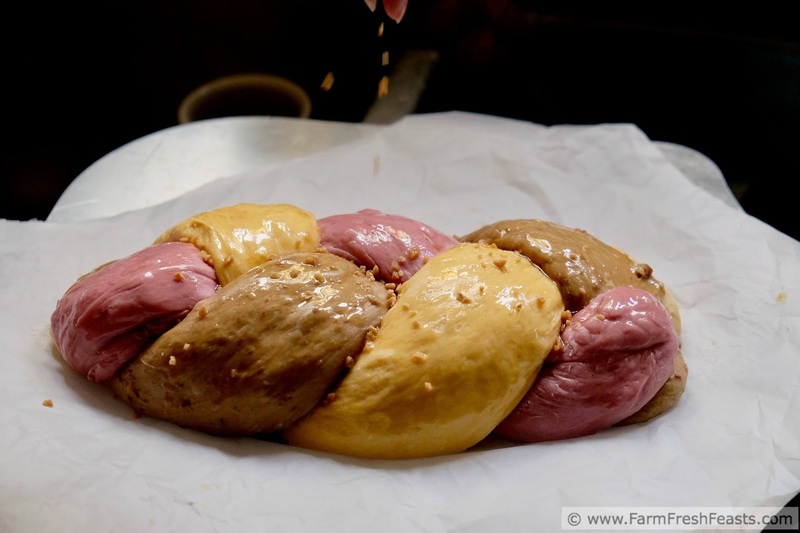 I've gotten creative using Community Supported Agriculture (CSA) farm share vegetables to naturally color the dough for a tricolor Mardi Gras Bread using purple sweet potatoes, orange sweet potatoes, plus matcha green tea powder to make the traditional colors in sweet bread form. 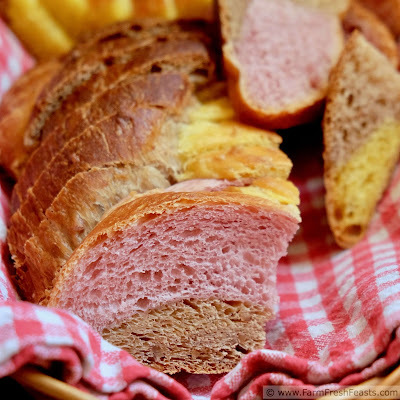 The basis of this bread is a sweetened, enriched dough. My sweet potato bread dough recipe was inspired by the Overnight Sweet Potato Monkey Bread in Donna Currie's book Make Ahead Bread. When you make dough using vegetables the moisture content varies widely depending on the age of the vegetable and the amount of rainfall during the growing season, so it's important to be familiar with how an enriched dough should act/feel/look like. 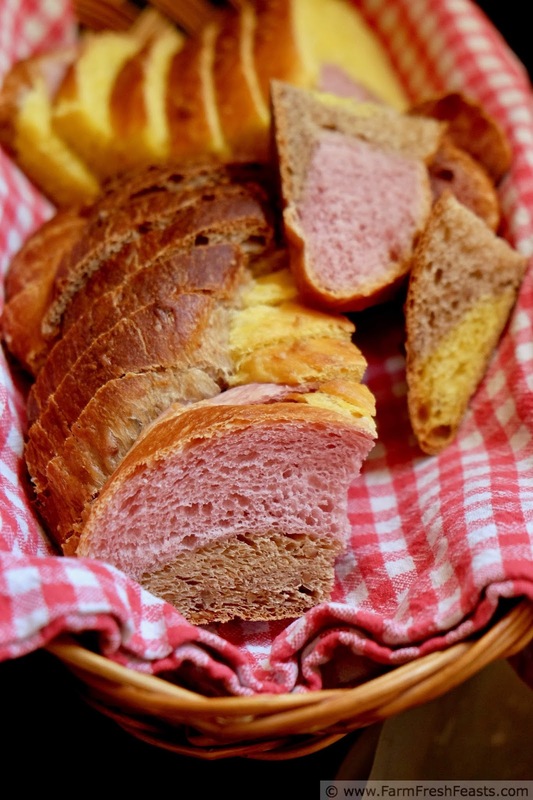 If you've never baked bread I would not recommend diving into this recipe. I'd suggest you start with the Pulla to get the hang of it, then branch out to incorporating roasted sweet potatoes into your dough. 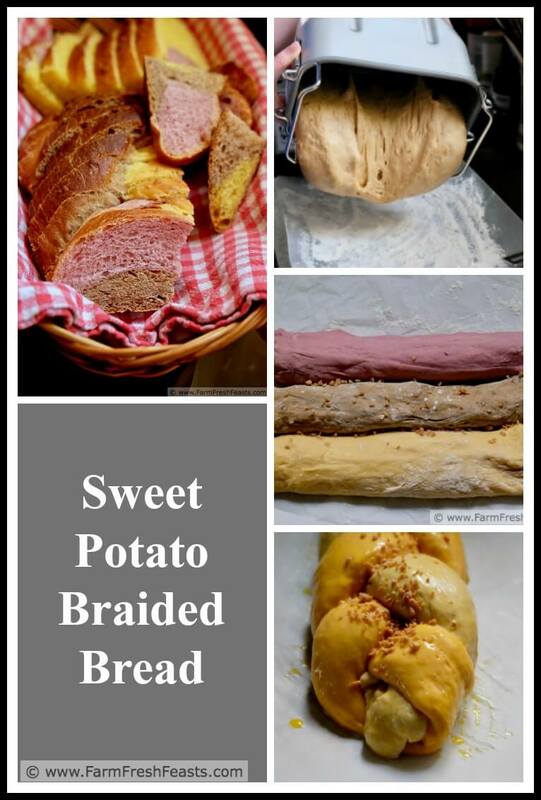 For this recipe I wanted to expand on the sweet potato dough concept with complementary flavors. I chose pecans and brown sugar because that's my favorite way to eat sweet potatoes. 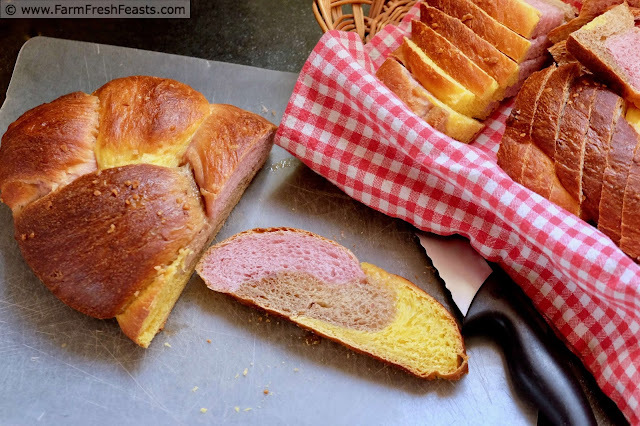 I've made this bread several times, with several variations. I've got a bunch of notes, so do be sure to read through before embarking on your baking session(s). 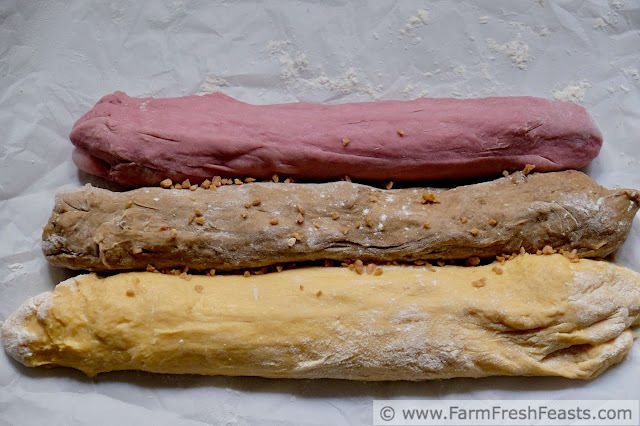 You can be as elaborate as you want, using 3 types of dough to make 6 loaves of multicolored purple/orange/brown bread. 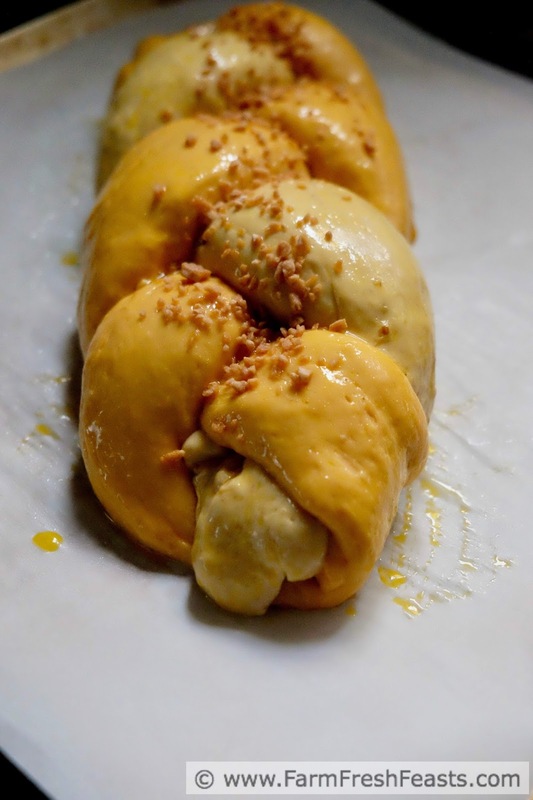 You could simply make a single batch of orange sweet potato dough and make two loaves of bread. Add in pecans or leave them out as you prefer. Sprinkle on maple sugar or use turbinado sugar as you prefer. This recipe is pretty forgiving, and the dough can be stored in the fridge for several days or frozen for several months. Note: to roast sweet potatoes preheat the oven to 400 degrees, scrub the potatoes, and place them on a parchment lined rimmed baking sheet. Check them at 20 minutes, giving a squeeze to see how tender each potato is. The sweet potatoes I get from the farm share are a variety of sizes, so I tend to roast a whole bunch in a single go, having the smallest potatoes at the front of the pan and the larger ones towards the back. Every 10 to 15 minutes or so I pull out the baking sheet and remove the potatoes that 'give' when I squeeze them. I let the potatoes cool on the counter, then remove their skins and smash the flesh. After that you're ready to add the cooled roasted sweet potatoes to this dough, refrigerate for a few days, or seal in a bag and freeze the potatoes for a few months. If you've got a bread machine, dump everything in according to manufacturer's instructions of the dough cycle. If not, I also make this using my stand mixer. I start by combining the water and yeast, adding in the cooled sweet potato, egg, and sugar. After that is mixed, I weigh the smallest amount of flour and add that to the bowl along with the butter and salt. I use the dough hook at this point. After several minutes I check and see if the dough is forming a ball around the hook. It usually isn't, so I add in more flour, about a quarter cup at a time, until the dough forms a ball around the hook and still has a sticky tail to the bottom of the bowl. You may need more than the total amount of flour I listed, depending on the moisture content of your roasted sweet potatoes. Once the ball is smooth and elastic, transfer the dough to a tall straight-sided oiled container, cover with a towel, and let rise until double. After the dough has doubled you can refrigerate for several days or freeze for several months. Label your bag! Prepare a baking surface by placing a piece of parchment paper on the counter. You'll shape on this, rise on this, and bake on this. Then toss it for easy clean up. Divide the dough into 2 equal parts. Nerd alert--I use my scale to confirm they are roughly equal. Set aside one half if you're only baking one loaf, and divide the other half into 3 equal parts. Pull and stretch each third into a foot long rope, then place on the parchment paper. Starting from the middle and working toward one end, braid the ropes together. Turn the parchment and braid the opposite end. Cover the dough with plastic and let rise in a warm place until doubled. I use my bread proof setting in my oven and it takes about 40 minutes, but on my kitchen counter it can take 2 hours until the dough is swollen like a pregnant giraffe. Preheat the oven to 375 degrees Fahrenheit. Brush the dough with beaten egg, then top with sugar. Bake for 20 to 25 minutes until golden brown. Cool on a wire rack. Slice when completely cool. To make 6 loaves of tricolor bread as shown in some of the photos, make a batch of purple sweet potato dough, a batch of orange sweet potato dough with white sugar, and a batch of brown sugar pecan dough. Here's what I used for the brown sugar pecan dough: 1+⅛ cups milk, 1 large egg, 4+¼ cups bread flour, ¼ cup brown sugar, 2 teaspoons kosher salt, 2+½ Tablespoons unsalted butter, 1 cup finely chopped pecans, and 2+½ teaspoons active dry yeast. Divide each batch of dough in half and then each half into 3 parts. 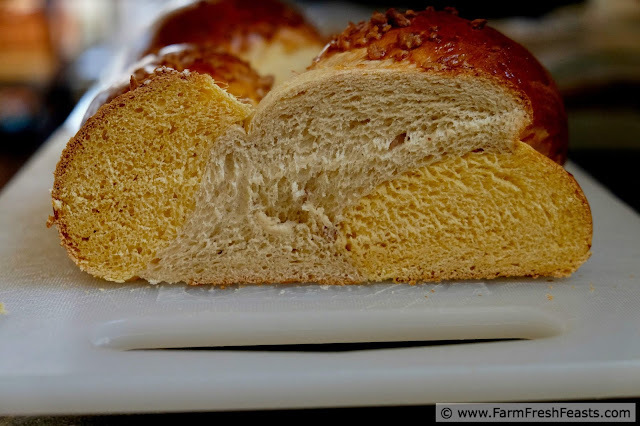 You'll have 18 ropes of dough which you can braid into 6 loaves, but remember--this dough chills very nicely, so you can make the doughs one day and braid/bake another day. Or you can make, divide, and freeze the dough portions and just thaw, shape, and bake the amount you want when you're ready. I have not tried to shape and freeze dough. I just throw the labelled bags in the fridge, thaw, form ropes, braid, rise, and bake as directed above. Giveaway open April 3- April 17, 2017 to residents of the continental U. S. age 18 and older. This giveaway is sponsored by Bernadette Martin of Rants From My Crazy Kitchen. No affiliation with the cookbook authors is implied. Winners will be announced on April 18 and will have 48 hours to respond. Prizes will be shipped no later than May 1, 2017. What a beautiful bread! I am quite envious of your baking skills :) Thanks for sharing such a fun Easter recipe!